I recently had a discussion with a rider who noted a typo in my book, The Good Rider. The chapter in question included suggestions that we should all consider the weight limits of a machine, to ensure that we can safely carry the intended load of riders and gear. With the riding season coming up soon, it’s time to revisit the subject. 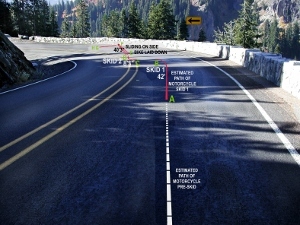 A few years ago a very heavy rider crashed his Honda Valkyrie attempting to make a downhill corner on White Pass. On a previous ride he had bent the main frame, so he'd attempted to improve shock sag by installing "heavy duty" shock absorbers on the rear suspension. After the crash, the rider sued the dealer who had sold him the after-market "heavy duty" shock/springs. In the ensuing depositions, the rider admitted he weighed in excess of 450 lbs at the time of the crash, and was carrying his mid-sized female companion on the back of the bike, plus clothing, travel accessories, and camping gear. Based on the skid marks and divots, he was approaching a downhill corner, realized he was a little "hot" and slammed on the rear brake. When he attempted the turn-in, the bike dug the left (aftermarket) highway peg into the asphalt, flipped over onto its right side, and slid into a low stone wall. It’s possible that a more skillful rider might have been able to wrestle a grossly overloaded bike around this turn, but the lack of cornering clearance played an important role in this crash. The bike’s suspension must have been seriously compressed even in a straight line. And calling shock/springs "heavy duty" doesn’t indicate their actual load carrying capacity. Frankly, I would be surprised if a shock manufacturer would build a shock with a capacity several hundred pounds over the GVWR. Fortunately for the dealership, the jury studied the evidence and decided the rider had done it to himself. We might all snicker at a grossly obese rider crashing and then looking for deep pockets, but there are many of us (who would consider ourselves "normal") who overload our motorcycles, without much thought to the consequences. And my observation at the Seattle show is that we’re not lacking for riders who have grown, umm… massive. I’m guilty here, too. It’s not just a matter of the bike touching down in a corner. Critical components of the bike can be overstressed, leading to structural failures. For example, a shock whose spring is too weak can’t absorb a bump because it’s already bottomed out. When the wheel hits a bump or a pothole, the axle, wheel bearings, wheel, and frame attempt to absorb the jolt. The front fork sliders, steering stem, swing arm, and main frame are likewise overstressed when the bottomed-out suspension can’t absorb the pounding. Even the battery takes a beating. Maybe it’s my vintage memory, but I seem to recall weight limits being available for just about all motorcycles, either on a decal on the frame, or at least in the owner’s manual. But today, many manufacturers seem to have downplayed weight limits, so you can be excused for not knowing the Carrying Capacity for your bike. Specifications such as rake and trail are commonly available, but not weight limits. Finding the numbers may take a bit of aggressive digging. Street Fighter 1500 GVWR 1050 lb. Street Fighter 1500 Wet weight 650 lb. Carrying capacity of Street Fighter 1500 400 lb. The carrying capacity includes whatever you load on the bike, including rider, passenger, and gear. In the case of our mythical Street Fighter 1500, the manufacturer has engineered the components to safely carry up to a 400 lb, load. How much can I overload? 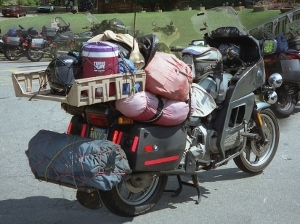 Since many motorcycles have a surprisingly limited carrying capacity, the common question is, " how much can I overload without compromising safety?" If you’ve packed huge loads on your bike and it hasn’t crashed yet, you might think this GVWR business is just conservative legal mumbo jumbo, like speed limit signs. On the other hand, if your bike has developed some strange behavior, that might be a clue that you should revisit the load capacity. Is your bike eating up tires or batteries at an alarming rate, or darting sideways in rough corners, or occasionally going into a nasty speed wobble for no apparent reason? Motorcycling is dangerous enough without taking unnecessary risks. The manufacturer makes a strong recommendation about GVWR. If you choose to ignore it, you’re rolling the dice. I hadn’t realized how difficult it is to find GVWR these days. At the Seattle bike show, I got down on my hands and knees in the displays of various manufacturers, to see if I could spot a weight decal. Few machines had any weight information, and salesmen for most marques didn’t seem to comprehend why I was looking or asking. BMW didn’t have any weight information showing on the bikes, but a salesman quickly pulled up some specifications on his computer. BMW is very clear here, with all the important specs including "unladen weight, road ready, fully fueled"; and "payload (with standard equipment)". 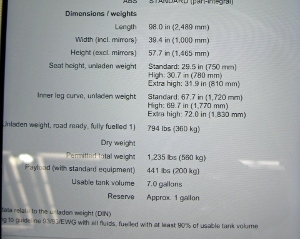 BMW calls GVWR "Permitted total weight." I don’t recall the model to which this chart refers, but it’s apparent that you can easily find the necessary BMW weight information at a dealership. 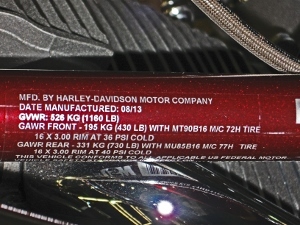 Most Harley-Davidson machines had a decal on the right frame down-tube. Curiously, H-D lists GVWR, plus Gross Axle Weight Restrictions (GAWR) for front and rear wheels, but not wet weight or carrying capacity. I’d be interested in hearing your feedback about carrying capacity. Is overloading an issue for you? Can you easily find GVWR and Carrying Capacity for your motorcycle? Is your dealership helpful in determining Carrying Capacity?